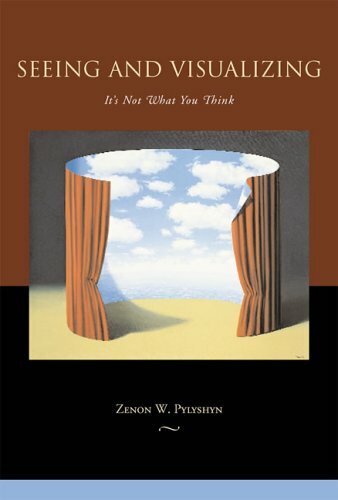 In Seeing and Visualizing, Zenon Pylyshyn argues that seeing is different from thinking and that to see is not, as it may seem intuitively, to create an inner replica of the world. Pylyshyn examines how we see and how we visualize and why the scientific account does not align with the way these processes seem to us "from the inside." In doing so, he addresses issues in vision science, cognitive psychology, philosophy of mind, and cognitive neuroscience. First, Pylyshyn argues that there is a core stage of vision independent from the influence of our prior beliefs and examines how vision can be intelligent and yet essentially knowledge-free. He then proposes that a mechanism within the vision module, called a visual index (or FINST), provides a direct preconceptual connection between parts of visual representations and things in the world, and he presents various experiments that illustrate the operation of this mechanism. He argues that such a deictic reference mechanism is needed to account for many properties of vision, including how mental images attain their apparent spatial character without themselves being laid out in space in our brains. The final section of the book examines the "picture theory" of mental imagery, including recent neuroscience evidence, and asks whether any current evidence speaks to the issue of the format of mental images. This analysis of mental imagery brings together many of the themes raised throughout the book and provides a framework for considering such issues as the distinction between the form and the content of representations, the role of vision in thought, and the relation between behavioral, neuroscientific, and phenomenological evidence regarding mental representations.